In my humble opinion, for KPI information to be useful to an organisation, it can’t be kept to one manager or department: it’s got to be shared with colleagues, stakeholders and clients so that decision making is collaborative, and more robust. While desktop dashboards, email alerts and paper reports are excellent ways to share data, nothing creates a bigger impression than a big screen display of your KPIs. Imagine displaying your KPIs in your office, lobby or workfloor, and always knowing what’s going on. With this much visibility, you can even motivate your team to maintain and exceed KPI targets. This article will show you some great ways to make use of a big screen display, and some of the things you should keep in mind if you’re planning to implement one for your organisation. By putting your KPIs on a rolling display in your office, you can communicate a vast amount of useful information to everyone who needs it. This keeps everyone on track, and makes it easier for your office or department to work towards a clear goal. This is great for a team focusing on one specific aspect of your business, such as HR, Finance or Support. 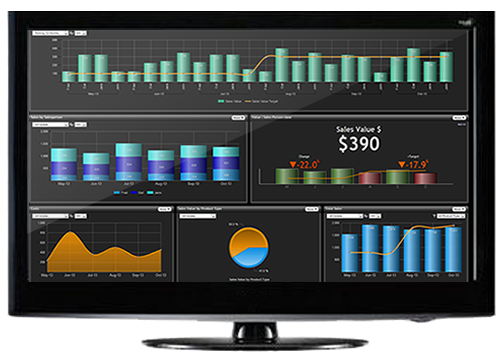 In fact, Target Dashboard’s own marketing team uses a big screen display in their offices to monitor vital data for online advertising. To motivate your workforce, a leaderboard that shows almost real-time change gives them something to work towards that they can directly affect. We’ve found that it’s also great if you want to generate some friendly competition for meeting new targets. It probably doesn’t need to be said that great-performing KPIs inspire confidence. With a big screen display in your public-facing lobby, visitor centre or meeting rooms, you can transfer this confidence to potential customers, investors or other stakeholders. Here are my tips on implementing these kinds of display in your office. Before I start, the first thing to remember is that your data should always be up-to-date. Big Screen Displays work best showing data as it happens, so making sure your dashboard provider can provide regular updating is a must. a. Only include information that can be digested at a glance. This means that you and your colleagues don’t need to stop what you’re doing to take in the latest stats. Unlike a regular KPI dashboard which you’d access from your computer, it’s best to not have any information that requires close scrutiny. 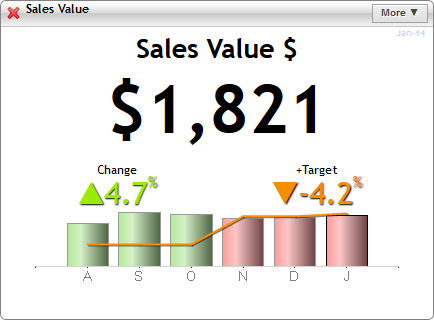 As an example, take a look at the Sales Value Gauge from the image above. The red and green columns below the large number signify which months have made or failed target. This colour-coding lets people instantly see the status of a KPI both now and over time. Also, it might not be useful to show your data over a large time period. It’s usually better to show only 5 or 6 intervals, as this gives the data context without becoming overwhelming. The size and number of charts in your screen display can also vastly help readability and usefulness. This depends on the way you intend the display to be used. If you’re using a display as an aid for a business team (as above), they’ll likely be in quite a close environment. 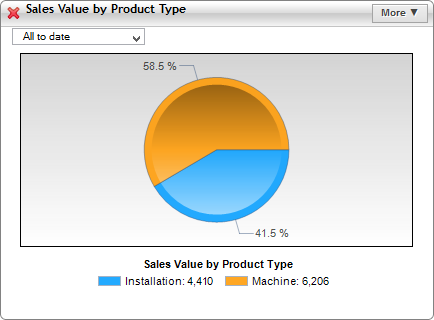 Therefore, you can afford to have more charts in your dashboard with a bit more detail. However, if your dashboard is being used for more distant displaying (workplace, lobby), it’s best to stick to fewer, larger charts. 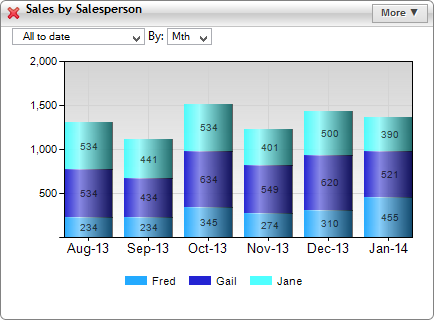 Around 4 or 5 charts per dashboard make them easier for users to understand from a distance. In my experience with Big Screen KPI displays, in general it’s best to focus on just a few important KPIs per dashboard. This gives the display focus, and provides a logical flow for viewers who don’t have time for in-depth analysis. 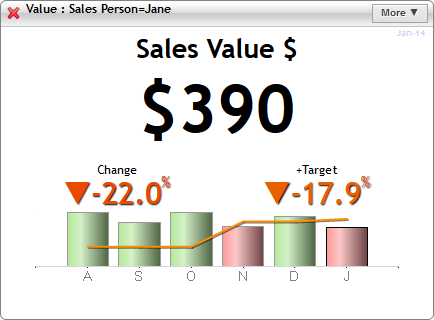 This example shows sales data from three different perspectives. As the information in each chart is the same but from different perspectives, it’s easy to follow the data between each view. - a comparison between number of views and conversions from advertising and non-advertising sources. However, they take these two KPIs, and display them from many different perspectives, such as by geographical location, platform, daily, monthly, and quarterly. Because the data is all related, it’s easy for the team to respond to issues and optimise our campaigns if need be. In order for a KPI display to be effective, it has to give viewers the following information as quickly as possible. Now, the visual elements of the display (charts, gauges, scorecards) are great for showing context, but to get the Current Figures in front of people instantly, I think numbers are actually better for this. This stacked column chart is annotated fully with numerical values, but it is still quite a visual chart. While this would be very useful for a small sales team using it to track distribution, using this type of chart on a sales leaderboard wouldn’t let people easily see the latest figures. Better to use a gauge with a large numerical display. This is the same data, but summarised with a large value. You can immediately see how much easier this would be to understand for people who only need the latest figure. Think of displaying your latest Customer Satisfaction scores, or Number of incidence-free work days. These numbers don’t really need a large amount of context, as generally, the higher the better. However, displaying the number of sales earned this month would require visual context, as even a very high number could still compare unfavourably to previous months. Therefore, finding the right balance of numbers and visuals will help you get the right message across. It tells us the distribution of product sales, but there’s nothing to say how recent the data is, or over what time period it shows. Remember, you only want to include what’s useful, so if your viewers do happen to have an understanding of the categorical data without context (as salespeople would probably have), then there’s no need to provide additional information. e. Above all, consider your viewers! As obvious as it sounds, I can’t stress this enough; having knowledge of the end-user of your dashboard screen display can be more important than any of these tips. If your colleagues find numerical data easier to digest, use that. If colour-coding is most effective, fill your dashboard with it. The easier it is for information to be understood, the more effective your investment in dashboards will be. Big Screen KPI Displays fulfil a different purpose to regular online dashboards. Their job is to provide maximum visibility to actionable data that doesn’t require any in-depth analysis to be useful and meaningful. By following the tips in this article, you can get your crucial data in front of the people who need it, and keep it there so that they are always aware of it. 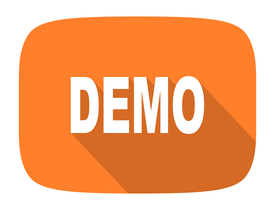 Learn how easy it is to visualise your data using Target Dashboard to gain a competitive advantage.